Some say, Diamonds are forever. Have you ever seen a diamond? They are precious. When we are doing a barbeque we need coal. 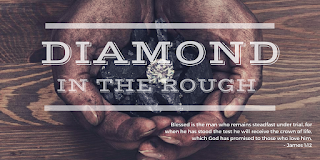 A diamond and coal are fundamentally made of the same thing. 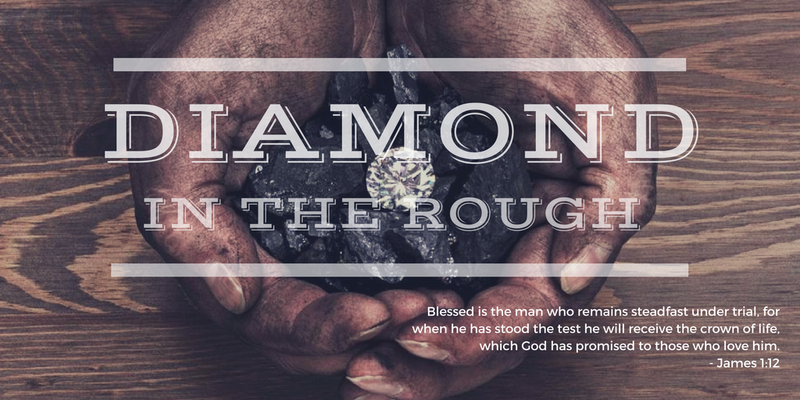 Theoretically, coal has the potential to become a diamond. We are like that. There is a process to help us mature and grow. In our everyday life we will encounter trials and persecution. James gives us another perspective. It doesn’t make sense to consider it pure joy. Q. So why does James urge us to consider it pure joy to face these trials? It is because the testing of faith produces perseverance. Perseverance takes time. The coal is kept in a place of high temperature and pressure for an extended period of time. God will allow trials, especially when we preach the gospel. Churches in India have been persecuted increasingly. Last week we saw in Acts 3 and 4 how Peter and John heal the lame man at the temple gate. Then a great persecution broke out, but they continued to proclaim the gospel. As we go out, be prepared to face opposition. Q. How can we face it? When we are rejected, we persevere. We don’t back down. Peter and John did not back down but boldly proclaimed the gospel. Acts 4:13- They got this boldness because they had been Jesus. We can’t do this in our own strength. We need the Holy Spirit. The disciples had even seen the resurrected Jesus. But they had to wait for the Holy Spirit. Q. 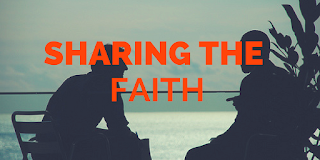 How many of us are diffident about sharing the word? Most of us are like that. Today we’ve got to tell the church- go out and do it. In Peter’s time they had to tell them to stop doing it. The start of any ministry is that we have time with God. There were corporate prayers. It is powerful to pray together. India needs much prayer. There are hidden agendas coming through political bodies. Our God reigns. So we will pray. We will be bold and proclaim the gospel. In verse 31 when they had prayed, the place in which they were gathered together was shaken, and they were all filled with the Holy Spirit and continued to speak the word of God with boldness. We normally associate power with healings and miracles. But when God’s power came upon them there were no needy people. There was an environment of community and love. God is working in us, we are going to grow and there si a crown of life awaiting for us. Romans 8: 18- “For I consider that the sufferings of this present time are not worth comparing with the glory that is to be revealed to us”. Whatever you are suffering this morning, please persevere. We keep our eyes on glory. Mother Teresa said, our stay on earth is like one night in a cheap motel. God will enable us to endure our suffering. Paul was beaten, flogged, shipwrecked... but he says, it is nothing compared to the future glory. Let us pray, be filled with the Holy Spirit and boldly proclaim the gospel. Let us persevere. Last week we stopped at Acts 2. On the day of Pentecost, the Holy Spirit was poured out on men. That day 3000 people get added to their number. In verse 41, we see that the church grew to 3120. They devoted themselves to teaching, fellowship, sharing, and prayer. 1. Great need- there is a great crisis happening, in country after country. 20 Mil people have been displaced right from Somalia, liBya, Syria... even individually people have great needs. People are suffering from different things. But as we meet people, they have difficult, impossible situations. We need to be like Peter and John, go into situations that have great need, and bring great hope. Let us look out for these needs. If you spend 10 mins talking to people you will discover their needs. The Kingdom has come, but let’s talk to people- let’s spread the kingdom out there. This means 5 words- Can I Pray for you? Most people are open to prayer. Sometimes, we say, we’ll pray for you, and forget about it. But make it a point to pray for them immediately. Let’s do it sensitively but immediately. 2. Great Miracle- when you pray for people and it gets answered, don’t they come back asking for the next thing? Expect a great miracle when we pray. The man was healed instantly. He went with them into the temple courts. He was walking and jumping and praising God. it was a miracle. He recognised Jesus did that. Peter and John at the back of that miracle started preaching the gospel. From verse 12- 17, peter said to them, ““Men of Israel, why do you wonder at this, or why do you stare at us, as though by our own power or piety we have made him walk? 13 The God of Abraham, the God of Isaac, and the God of Jacob, the God of our fathers, glorified his servant[b] Jesus, whom you delivered over and denied in the presence of Pilate, when he had decided to release him. 14 But you denied the Holy and Righteous One, and asked for a murderer to be granted to you, 15 and you killed the Author of life, whom God raised from the dead. To this we are witnesses. 16 And his name—by faith in his name—has made this man strong whom you see and know, and the faith that is through Jesus[c] has given the man this perfect health in the presence of you all.” In verse 19 he says, “Repent therefore, and turn back, that your sins may be blotted out, 20 that times of refreshing may come from the presence of the Lord, and that he may send the Christ appointed for you,”. So we share the gospel with them at the back of a miracle. In John 14:12- “”. He is saying, believe me on the basis of the miraculous works I am doing. Jesus did great things, but he says we will do greater things. For this, we need the power of the Holy Spirit. When He is upon you, you become bold. 3. Great opposition- The Sadducees seized Peter and John. The enemy does not want people to be saved. So wherever the gospel is preached, there will be opposition. Don’t be surprised by it. Later on, we see that they were flogged. Sharing the gospel is not a safe thing. In Acts 4:26- “” After being flogged and beaten, they are praying for boldness to proclaim the gospel and for miraculous signs and wonders to follow them. It is something else to go into a hostile world and tell people about Jesus. 4. Great harvest- the number of men grew to about 5000. There is a great harvest. If you want to see the kingdom come, Peter and John are no more. Now we have all of us. Prayer is important. We need the Holy Spirit to proclaim the gospel. Then, talk to people. Let’s get off our phones. It can take up all our time. Let’s spend time having real conversations with people. take a step and say, can I pray for you. We are the agents of the Kingdom to take it forward. We need to go out of here thinking, we can do it. What is the church? People would point to a building. But the church is people. We are the church. In John 16 when Jesus asks the disciples, who do you say I am, Peter responds by the revelation of the Holy Spirit, you are Christ, the Son of the living God. Jesus replies to this, you are peter and on this rock I will build my church. He will build his church and nothing will overcome it. Which is this church that he is building? In Acts, we see the first church coming into being. 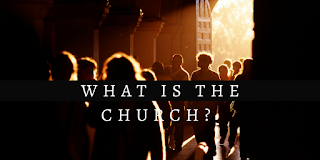 We will look at 2 aspects of this church- the composition and character of this church. Composition of the church- In verse 40- it says those who accepted his message were baptized and 3000 were added to their number. From 120 people, they became 3120. 1. They were born- again. They were people who were redeemed. They repented and demonstrated it in their actions by baptism. Then they were filled with the spirit and were added. They belonged to that body. It wasn’t a casual thing. They were committed. This is what Jesus is building. 2. They were centred around the teaching of the apostles. It was consistent teaching. Doctrine is an important part of the early church. The word of God is like spiritual milk to build ourselves up. At Word of Grace, we do that through the Sunday teaching, Indepth discipleship training, GYM groups etc. Be devoted to receiving the word of God in your life. 3. They were devoted to prayer. Prayer was critical in the blueprint for God’s church. Spending time in his presence. Mark 1:35- very early in the morning, Jesus went off to pray. There is personal prayer and group prayer. We meet on Fridays for this prayer. 4. They had fellowship together- fellowship is relationship. They had deep relationship with one another. As they did this, there was an output. That is the character of the church. 1. Everyone was filled with Awe- the result of being a church is that everyone who met them were in awe of what God was doing. Miraculous signs and wonders- we are expecting God to do something. To change lives. We want to see more! 2. Unity- all the believers were together. There is something about worshipping God together. They broke bread and ate together with glad and sincere hearts. Meet, eat and share- what they did. Eating together is a big part of accepting one another. India needs the gospel. When was the last time you ate together with someone from this body? We need to find out about one another’s needs. It will happen as we meet and speak with one another. In the early church, they sold their own possessions to meet each other’s needs. 3. They ate with glad and sincere hearts. These were a happy church. We want to be full of the joy of the Lord. 5. The Lord added daily to their number. The end result was phenomenal growth. The church grew rapidly. Each one of us is a part of the church. Together, we form a holy temple for God to dwell in. we are responsible to help this church be built according to Jesus Christ’s blueprint. See if you are personally fulfilling these things. As we fill this gap, the church will definitely grow. We will be like this church. Q. How many of you have exchanged something? You give your old phone and get a new phone. Earlier, people would knock doors ask for old clothes in exchange of vessels. That is not a great exchange. Today we will look at a great exchange. We are not unfamiliar with this but it is important to remind ourselves of it and value it. Secondly, as life gets more and more busy, we sin. We do things that are wrong and don’t do things we should. This great exchange gives rest to our souls. God is for us even when we fall short of His standards. This verse is said to be the essence of the Bible. We will look at 4 things from this verse. We are sinners by nature and by action, right from birth. The evidence for sin is tremendous. The result of sin is a life without God and hell. But in this verse, there is good news. This is the solution to the sin problem. 1. Begins with God- There are no men saying where is God. The solution started with God. Romans 3:11-12 “None is righteous, no, not one; no one understands; no one seeks for God. All have turned aside; together they have become worthless; no one does good, not even one”. This is God’s judgment about man. John 18:11- “Put your sword into its sheath; shall I not drink the cup that the Father has given me?” Who planned that Jesus will die on the cross? It is the father’s plan for our sake. Romans 5:8 tells us that while we were still sinners, Christ died for us. 2. Jesus was the only one who had no sin- Romans 3:23 says all have sinned. But Jesus was blameless. John 8:46- Jesus could not be blamed. In him there is no sin. No man could pay for another man’s sin. We can’t help one another. So God sent Jesus to come to earth and he lived a sinless life. Heb 7:36- “For it was indeed fitting that we should have such a high priest, holy, innocent, unstained, separated from sinners, and exalted above the heavens.” Heb 4:15- Jesus was sinless from the beginning to the end. 3. 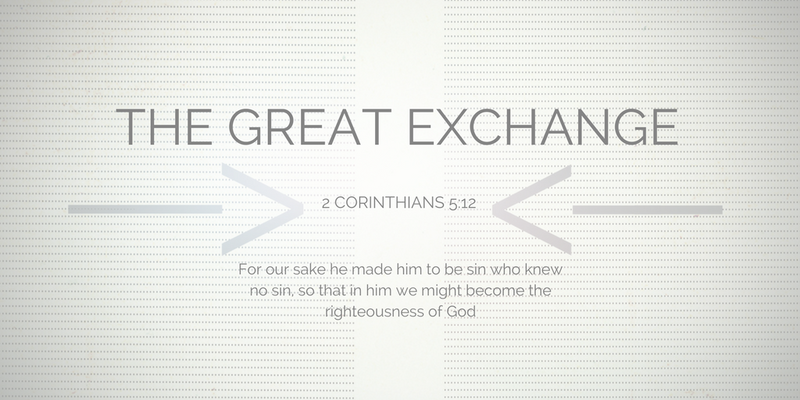 God made him to be sin for us- this is the great exchange. It does not mean that Jesus sinned. Isaiah 53:6- “All we like sheep have gone astray; we have turned—every one—to his own way; and the Lord has laid on him the iniquity of us all.” All our collective punishment was put upon him. In the Second World War, in a Nazi Prison, there were a group of prisoners who were to shovel and come back at the end of the day to the prison. Everyday the prisoners and the spades are counted and one day a spade was missing. The police threatened to kill one person if they don’t own up to it. Someone steps forward and owns up to it. He is killed immediately instead of the other guy he was going to kill. Later that day they find that all the spades were there and that it was a miscalculation. This man gave his life in place of another. This is exactly what Jesus has done for us. It was horrifying that he was separated from God the Father. 4. In him, we might become his righteousness- The word is imputed. The benefits of his sinless life are credited to each one of us. You are as righteous in your position as Jesus is. We can come before a Holy God because of this righteousness. We can respond in two ways. Take it for granted. Can I go on sinning then? If we ask this question, we haven’t understood the gospel. Our desire needs to be to please Jesus. We are a new creation. The second response is in 2 Cor 5: 15- “and he died for all, that those who live might no longer live for themselves but for him who for their sake died and was raised.” We evangelise. 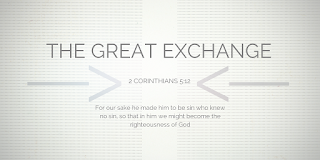 We reconcile people to God. We want to share this news with everyone we meet. Jesus the sinless saviour died in my place. Q. When was the last time you shared this message with someone? In our nation and across the world, we are living in dark times. Things are not getting better. The only solution is taking this message of Jesus to the world out there. You are here for the purpose of telling people about this great exchange.